UPDATE: The Salomon XA Advanced Skin S-LAB 12 set is now available as well. This time of year, we inevitably find ourselves excited about some hotly-anticipated 2012 products, which typically begin arriving in February. This year, the most highly sought-after item of all is the Salomon XT Advanced Skin S-LAB running pack, and its new siblings the XT Skin Pro 3 and the XA Skin Pro 10+3. The anticipation isn’t new; in fact, in 2011, Salomon completely sold out of these packs. On the Thursday before the 2011 Rock/Creek StumpJump 50k, Salomon was able to scrounge up 5 packs for us… and they all sold before the start of the race on Saturday morning. Seeing that level of demand for the Advanced Skin S-LAB pack, and then seeing them again out on the trail the next day, tells the story. We’re also expecting a 4th pack — the Salomon XA Advanced Skin S-LAB 12 Set — to arrive in the near future. In the meantime, let’s take a look at the three Salomon running packs that have already arrived. This is, simply put, the best hydration pack for ultra running that you can buy. I’ll do a quick rundown of the features, but here’s a caveat: this pack is so customizable, with adjustable everything and removable pockets and the like, that you’ll definitely be able to dial this in for exactly what you need. First things first — let’s talk about Salomon Sensifit. I know that sounds like marketing jargon, but they’re talking about the way this pack hugs your body, and it’s honestly incredible. Whereas most running packs feature two shoulder straps and a separate waist belt, this pack has wide, low-profile straps that encircle the body, joined in the front by the twin-link closure. Instead of jangling up and down on your hips and requiring a tightly-cinched waistbelt to stay put, the whole pack floats around your ribcage, never constricting your motion (or respiration) and never binding. The materials are ultra breathable and no other pack resists abrasion like this one does. With two sizes available, and a multitude of adjustments including load lifters on the shoulder straps, this is the best fit you can get for long distance running. There are more features than I even dare to list here, but the two that stand out are one that every running pack has — the hydration bladder — and one that’s exclusive to Salomon, the “4D pole holder.” For more close-up photos of some pack features, like those at right, check out our unboxing photos on Flickr. The hydration bladder is a 1.5 liters and is BPA free / PVC free. What catches my attention, however, is the closure; not only is it extremely secure, it opens very easily and opens wide for fast filling at aid stations. This also makes it extremely easy to clean. It’s super easy to use, and completely foolproof. In addition, the sleeve that the bladder fits into is lined with a thermally reflective material, to shield your cold drink from the radiant heat of your body. 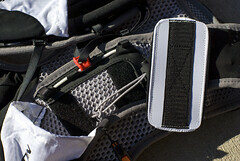 Finally, the pack’s compression straps and the form-fitting shape of the pack keep it from sloshing around. As for the 4D Pole Holder, it’s borne of the idea that, for some ultras, you’re going to want to carry an ultralight hiking pole (like the Black Diamond Distance Trekking Poles). While I haven’t tried this feature, the idea is to allow access to stash (and un-stash!) your poles without having to stop running or remove the pack. One of the tags that comes on the XT Advanced Skin S-LAB 5 has illustrations with step-by-step instructions on using the 4D Pole Holder. In addition, this pack has removable pockets, so you can adjust the amount of storage you need based on how long your run is or what the conditions of the day are projected to be. See photo at right. Here’s a feature list: Sensifit harness construction with load lifters, compression straps, large main compartment, 2 chest pockets, 1 mobile pocket, 1 removable pocket, 2 zipped belt pockets, 1 safety pocket, bite valve with on/off system, underarm hydration routing, insulated bladder sleeve, attached whistle, included emergency blanket, reflective details. Honestly, this is a piece of gear that you can really sit down with and tailor to your specific needs, and it would be impossible to list all of the features here. The pack is washable, made from what Salomon calls “elastic power mesh” and weighs 1 lb, 6 oz. The total volume of the pack (including the hydration bladder) is 5 liters. The XT Skin Pro 3 pack is seriously sweet: it’s a scaled-down version of the XT Advanced Skin S-LAB 5, with the same 1.5 liter hydration bladder but a slightly lower overall pack capacity. In exchange for the downsized volume, however, you save a whopping 10 ounces in weight compared to the Advanced Skin S-LAB 5, and it’s $50 less expensive! You still have room for a lightweight running jacket in the exterior pocket, you still get the 4D trekking pole attachment system, the same wraparound Sensifit construction that keeps you from wanting to tear the pack off of your shoulders during the last hour of the Lookout Mountain 50-miler. The difference? 1 chest pocket instead of 2, no zippered belt pockets, no compression straps (no need at this size! 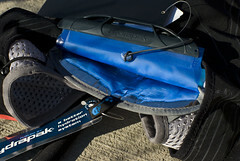 ), no insulated hydration hose, no emergency blanket and the XT Skin Pro 3 is one-size-fits-all. This is the minimalist’s choice in Salomon running packs, where the race distance or weather conditions demand a full hydration pack but your primary concern is speed. Where the Salomon XT Skin Pro 3 pack is a stripped-down version of the XT Advanced Skin S-LAB 5, the Salomon XA Skin Pro 10+3 pack is a similar, streamlined version of the XA Advanced Skin S-LAB 12. It’s large enough to carry not only your hydration but all of the required equipment for ultras like Ultra Trail du Mont Blanc (UTMB) and other long endurance races. Of the Salomon running packs featured here, the Skin Pro 10+3 is probably the most versatile for activities besides running; this would make an excellent day hiking pack, especially in temperate weather, and can double as a mountain biking hydration pack. Wondering how long these will last? Well, just while I was writing this article, four of these packs have sold on rockcreek.com! We have plenty of them coming in, but with demand so incredibly high I wouldn’t hesitate if you’re thinking of picking one up. I think that’s just the angle of the mouthpiece in the Advanced Skin 5 photo; I just took a look at both packs for you and they have identical mouthpieces, but neither appears to include a separate cover. In other words, they have the rubbery mouth piece so you can close the tube, but not any kind of cover for the mouthpiece in case you’re splashing through nasty mud or dealing with dusty desert conditions. Can you please post pictures or email how the 4D pole system works? I failed to get my poles securely attached before my first 50K and suffered. I love this pack, but the whole pole attachment system is confusing. I am considering going to Home Depot and purchasing a pack of bungee cords and just trying some sort of MacGyver move for my next race. I just did a youtube video to show how they work as it can be hard to figure it out.